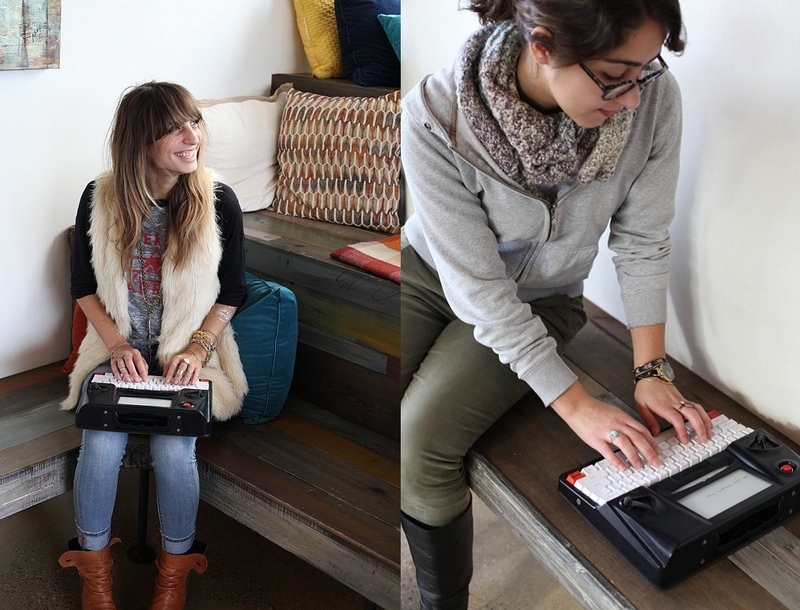 The Hemingwrite is a distraction-free writing tool. It combines the simplicity of a typewriter with all of the modern conveniences of living in 2014: cloud documents, e-paper display, and full-size mechanical keyboard. On the surface that sounds pretty cool, right? 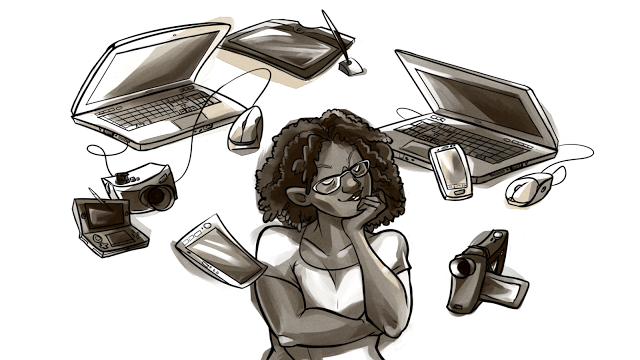 As a writer I am down with dedicated writing tools and tools that cut down on distractions. But I’m not down with the Hemingwrite. Why? My objections start with the price, end with the functionality, and somewhere in the middle I get really hung up on the pretentiousness of it all. The Hemingwrite is supposed to be a simple tool. 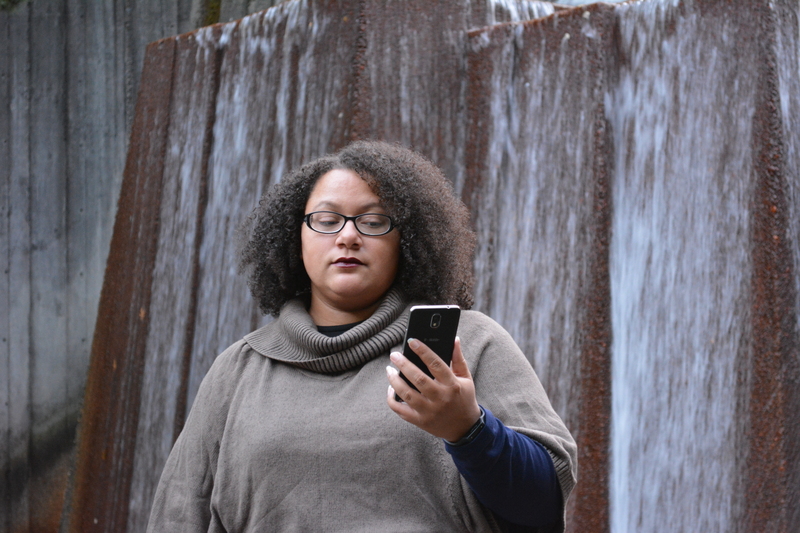 Text documents, a small ePaper display, an aluminum and plastic typewriter-like body, and Wi-Fi. So far that’s fine. But at retail it’s supposed to cost $500. That’s the price of a netbooky tablet and more expensive than a Chromebook. Why does it cost so much? I know part of it is because the company making this is small, and thus it’s hard to get parts and manufacture in numbers that make it possible to get bulk pricing. Still though, this seems like a pretty simple machine for that amount of money. I know I think this because it’s impossible for me to look at the Hemingwrite without thinking of the various AlphaSmart models. That’s because the Hemingwrite is basically an AlphaSmart Dana or Neo with less functionality, more weight/bulk, and a hipster-cool name. Seriously. Even the AlphaSmart 3000 has more file slots (8 or 16 as opposed to 3) and weighs 2 pounds or less. Most AlphaSmarts didn’t have Wi-Fi, but some did. And all of them managed to cost less than $500–many were under $200. And the design, while cute, makes the Hemingwrite bulkier than it needs to be, from what I can tell. Perhaps I’ll think differently when I get to try the keyboard, but the AlphaSmart keyboards were very nice, tactile-wise. They didn’t look like old school typewriters. They did have freaking arrow keys. Yes, the Hemingwrite lacks arrow keys. There’s old school, there’s distraction free, and then there’s limiting functionality for hipster cred. There are some things I like about this product. The display is tall instead of wide, which I prefer, and shows more text at a time than the original AlphaSmart design. I like that it will continuously upload your files to a cloud service so you don’t have to physically connect it to a computer to get the text off of it. The typewriter shape is kind of cute, despite my snark about it. I can’t deal with the weight and expense, though. 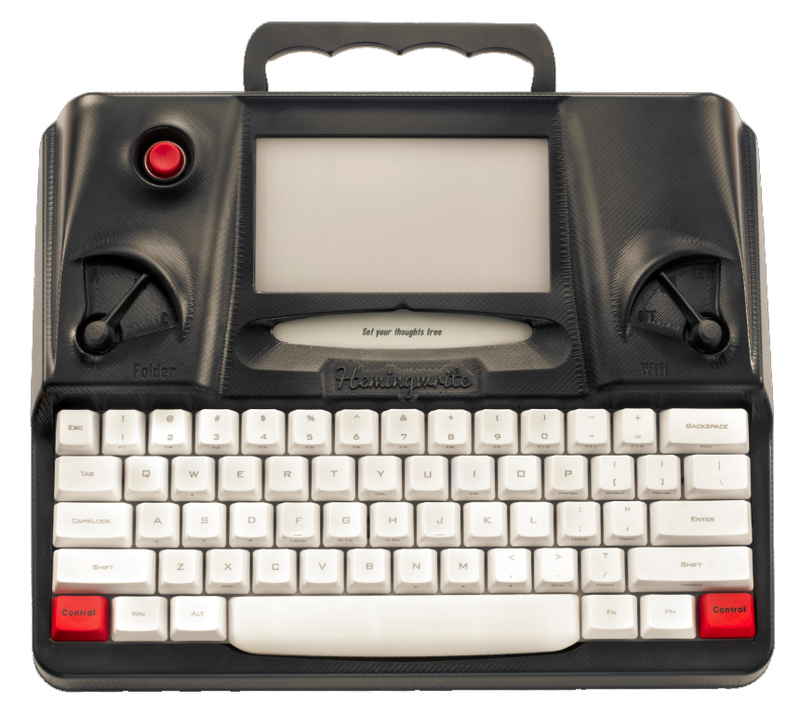 Currently, the Hemingwrite is fully funded and then some and scheduled to come out in the fall of 2015. 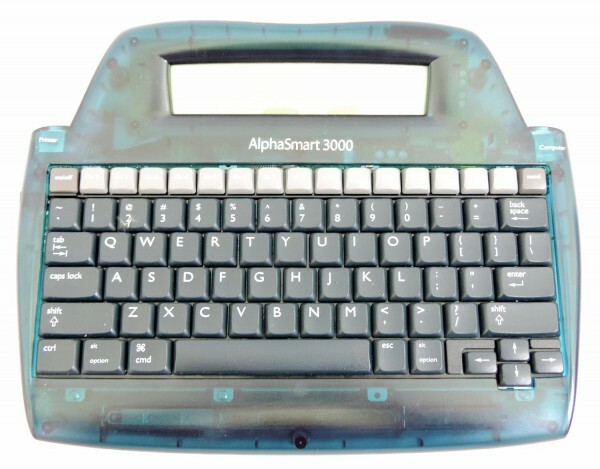 If it turns out to be a hit or even a moderate success, I hope it inspires the company that used to make the AlphaSmart to reboot the line. Or maybe some enterprising entrepreneur will crowdfund the money to buy the patents for the technology, give it a bit of an update, and bring the AlphaSmart back into the world under another name. After all, old AlphaSmarts still sell pretty well on Amazon and eBay. You can find the 3000 model, the Dana, and the Neo in good condition. Hell, I recently gave my original model away to a friend only because I no longer have a computer with a PS/2 port. It still worked just fine even after gathering dust on a shelf for years. I’d be willing to invest in a used AlphaSmart before I backed the Hemingwrite the way it is now. But everything that survives evolves, and maybe version 2 or 3 will catch my eye. Meantime, I’ll keep my eye on this first model. Maybe I’ll be surprised once it comes out. I’m not a hipster, but I was totally gung-ho for the Hemingwrite… until I found out that there were no arrow keys. That’s ridiculous. Many people (myself included) do not think linearly when writing. And for such people, the lack of arrow keys makes the Hemingwrite completely useless as a writing tool. I was funding it, but decided to buy an electric typewriter instead when they announced the lack of arrow functionality. Saved myself $400 in the process too. Electric typewriters do indeed have an appeal! I’m just big into portability. Interesting article! I’ve been hankering for a good typewriter for a long time, and while I was researching models on the web I ran across this “Hemingwrite” machine. Initially I was intrigued, but after I saw the price (gasp!) and noticed the absent arrow keys, I couldn’t really understand the point of it. I’m buying a typewriter because I want the physical clunk of keys under my fingers, the weight of real paper in my hands. A digital model makes little sense to begin with, and the ridiculously limited functionality robs it of any redeeming features. As you say, this seems like a very “hipster” thing. ???? Completely with you on the points you’ve made about it being an Alphasmart with more cost/weight and less functionality. I completed a Masters Degree on an Alphasmart Neo (mainly) with no problems. If you *just* need to write, this hipster doofus nonsense ain’t gonna help. And no arrows keys – suicide. Unless there is a way to use some other keys as arrow keys using a supersecretkeyconfiguration then it’ll be a real pain to use. Having to use another machine to edit what you’ve written on the Hemingwrite will be a real pain. And it weighs HOW MUCH!? I’m out – maybe v3.0 will have ironed out the massive wrinkles, but for now it’s a nah. I too was interested until I saw the price and the lack of arrow keys. I’m also not terribly fond of the fact that it uses only Markdown formatting. I’m sorry, but I’m used to hitting Ctrl+B to get bold, Ctrl+I to get italic, etc. I started out on a manual typewriter, but that doesn’t mean I want to go back to limited editing capabilities. The final nail in the coffin is that a Chromebook set to go directly to Writer.bighugelabs.com will have all the same capabilities as the Hemmingwrite. No, it won’t have a mechanical keyboard, but that’s something I can live without (and if I really want one, I can buy one and connected it to my Chromebook). It will upload to the cloud. It will be distraction-free writing. It will be free of the Windows/Mac prompts and updates. It will be secure. It will cost less than a Hemmingwrite. If they were asking $100 for it, I’d consider it worth it. If they asked $150, I’d have to think about it. At $500 they can forget about it. I could buy a really nice old-school disk-based word processor for that, and have money left to buy a chai latte.